yookai nabe 妖怪鍋 "monster soup"
from local wild boars and vegetables, flavored with local miso paste. yookai koohii 妖怪珈琲 "monster coffee"
nezumi otoko jiru ねずみ男汁 "soup of the mouse-boy"
yookai jiru 妖怪汁 "monster soup"
medama ojaji jiru 目玉のおやじ汁 "soup with the man of only one big eye"
This small village on the slopes of the high Shikoku mountains in the Iya Valley area uses local and other monsters to bring back some life into the ageing village. 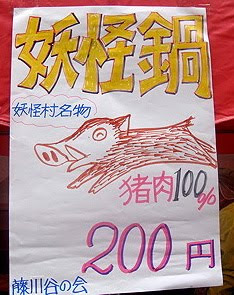 Every year in Summer there is a "Monster Festival", where they serve a big pot of "monster soup". 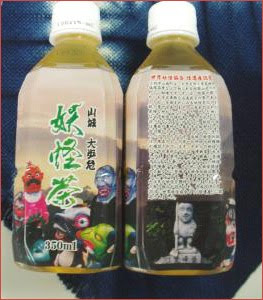 They also sell "Monster Tea", yookai cha 妖怪茶. If you find him like a baby crying and pick him up, he will get heavier and heavier and turn into stone right there. Konaki-jiji 子泣き爺, Konaki-Jiji, "Old man crying"
The Konaki-jiji is said to be able to take the appearance of an old man or a baby. In either case, the spirit lures an unwary bypasser towards it and allows him or her to pick it up. After the spirit is picked up, it suddenly becomes a heavy stone that crushes the victim to death. In some versions of Konaki-jiji stories, the spirit is that of a baby left to die in the wilderness. The Konaki-jiji can be traced back to family records in Shikoku where the term was used to describe an old man who sounded like a child when he cried. 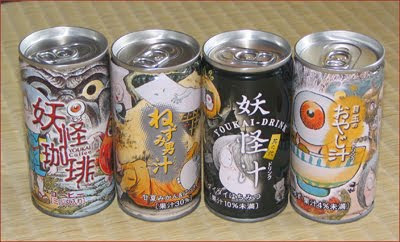 The term was eventually used in a national encyclopedia of yokai and became a nationally known phenomenon. If people hear him cry in the far mountains, there will be an earthquake. On more than 80 spots in the valley, there are "monster legends". Some monsters teach children and the local people to come home before dark, or not to build a house on the slope, because the ground is not safe and prone to landslides. The children study the local monsters at school and also learn about all the old monsters of Japan. The grown-ups prepare large faces of styropor for the annual monster procsssion during the monster festival 妖怪まつり. There is also a "monster band" with some music. The region is now one of the worlds "monster protection areas" 怪遺産 of the world monster association 世界妖怪協会. Konaki Jijii is a comic, absent-minded old yōkai man who attacks enemies by clinging to them and turning himself to stone, increasing his weight immensely and pinning them down. He and Sunakake Babaa often work as a team. The original konaki jijii is a ghost which is said to appear in the woods of Tokushima Prefecture in the form of a crying infant. When it is picked up by some hapless traveller, it increases its weight until it crushes him. 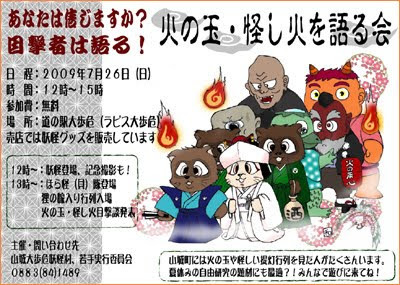 Konaki-jijii first appears in a cameo as one of many yōkai attending a sukiyaki party in the story A Walk to Hell before making a more prominent appearance in The Great Yōkai War. In the 2002 Kodansha International Bilingual Comics edition, he is referred to as Old Man Crybaby.
. Oni 鬼　Demon Amulets .